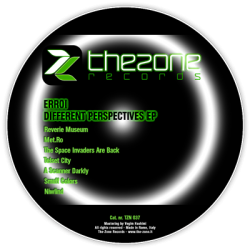 A mental musical journey with “different perspectives” from Marco Erroi, which can transport the listener into an alien’s scenario. Open the album: RAVERIE MUSEUM, totally ambient and space with the presence of voices that makes it clear right away that we are moving to distant worlds. “THE SPACE INVADERS ARE BACK”, “TELESET CITY” and “SMUFF COLORS” 3 tracks totally hypnotic minimal also characterized by dark rumors, by dark bass and deep-repetitive’s synths. A whole that makes a bit ‘in mind the scenario of Drexciya and Underground Resistance. with the addition of synths esoteric able to create moments of great suspense. A close “NIWLIND” much more electronic, synths and spatial rhythms, less minimal, bringing us back to earth leaving a great desire to return to observe those worlds so different from our daily living.